Rabbi Moshe Smolkin grew up in Texas and New Mexico. He had a love of flute and saxophone, chess, science and religion. Rabbi Smolkin earned his B.A. in Mathematics from Brandeis University, but also enjoyed classes in Hebrew, Yiddish, and philosophy. At Tufts University, he earned his M.A.T. in Secondary Mathematics Education. Rabbi Smolkin taught High School Mathematics in the Boston area for over 5 years, working in urban and suburban environments. He particularly enjoyed his teaching experience at Gann Academy, a pluralistic Jewish day school in Waltham, Massachusetts. 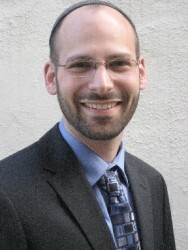 Rabbi Smolkin began rabbinical school in 2004 at the Ziegler School of Rabbinic Studies at American Jewish University in Los Angeles. During that time, he gained experience teaching religious school, working at Camp Ramah in Ojai, and serving as an interfaith student chaplain at UCLA Medical Center. In 2006, as part of his rabbinical training, Rabbi Smolkin studied for a year at the Schechter Institute of Jewish Studies in Jerusalem. When he returned to Los Angeles in 2007, he served for two years as the Intern Rabbi at Mishkon Tephilo in Venice, California. In 2009, Rabbi Smolkin came to Ohavay Zion Synagogue. He found OZS to be a wonderful and warm community. It was clear that people cared for one another and were interested in learning and growing in their Judaism. In his first few years at OZS, Rabbi Smolkin created a number of new monthly programs emphasizing the Jewish value of forming community. During Kids’ Shabbat, families eat together, sing songs, and hear stories from the PJ Library. During Youth Shabbat, adolescents lead services and welcome our friends from Stewart Home School. During Young OZS-ers, people in their 20’s and 30’s create community and learn Torah together. And during the OZS Shabbat Dinners, the whole OZS community socializes and comes together to enjoy a Shabbat meal. Rabbi Smolkin also brought with him a great love of song and an emphasis on learning. Saturdays Services include more joyous singing. During the Torah service on Saturdays, Rabbi Smolkin illuminates points of Torah, and encourages people to question and challenge the text, searching for deeper meanings. Rabbi Smolkin also seeks to foster a love of Torah amongst the adolescents. He created Jewish College Prep, a three year curriculum for High School Students focusing on Bible, Talmud, and Jewish Mysticism. Rabbi Smolkin has also taught a variety of classes for the whole community, such as Introduction to Judaism, Kashrut, and Jewish Prayer. Rabbi Smolkin is proud to be part of this inclusive and participatory community. He looks forward to continuing to serve Ohavay Zion Synagogue and all who enter its doors.